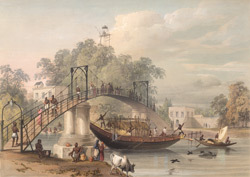 This coloured lithograph is taken from plate 19 of Sir Charles D'Oyly's 'Views of Calcutta and its Environs'. Colonel William Tolly wanted to create a functioning canal in the city by enlarging the dried-up bed of the Kidderpore Creek, to facilitate the passage of ships from the river Hooghly to the delta in the east. Completed in 1777, the 17-mile long canal was popularly known as Tolly's Nulla (nullah meaning creek-bed). D'Oyly's conspicuously Romantic treatment of the bridge is very different from the down-to-earth treatment of the same subject by William Wood. A budgerow (a native barge carrying passengers) is seen passing under the bridge and the high platform in the far distance is a watch-post for fire.